I’m off to Cyprus tomorrow morning at 7am. and am hoping for a few days of sun and rest. 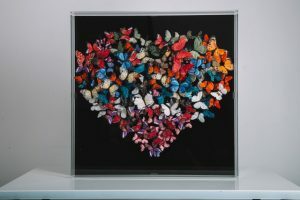 My last work related task today was to deliver 3 more works to Tanya Baxter in Chelsea in time for the Hong Kong art fair. 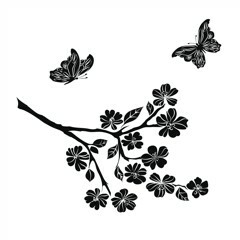 When I return, the new seasons collection of Butterflies will have arrived from my supplier and I’m very excited. Just like the hatching of real butterflies, my feather variety also arrive once a year. This gives me a real creative boost and is a very busy time. 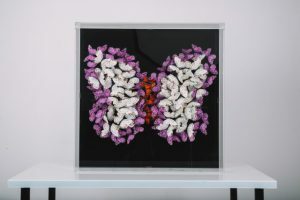 The butterflies are treated to ensure that they remain colourfast and the wires are trimmed to ensure they fit into the acrylic boxes. Finally, the various species and colours are boxed to ensure ease of selection when making the works of art. My next blog will be posted upon my return during the 1st week on May. Last Saturday in very chilly Herts. I recently celebrated my 74th birthday. 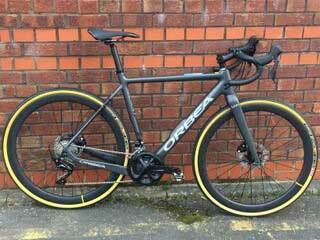 I’m fortunate to be healthy and happy enough to enjoy life to the full and have just added a new bike to my modes of transport. Of course this has nothing to do with Butterflies but is about me and my hobbies, one of which is cycling. Hiding within the sleek lines is a battery and a motor….yes its an ebike but you wouldn’t know it. Help getting up hills and home after a long ride is just what I need and only I will know what advantage I now have. Happy days. 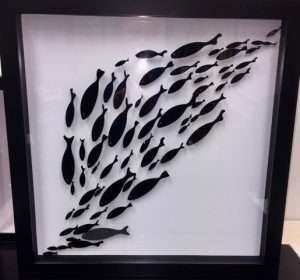 Amongst the items is a new black etched acrylic panel which I am intent on developing using additional colour palettes as well as alternative background designs. The attached image is not great due to reflection but gives an idea of its appearance. 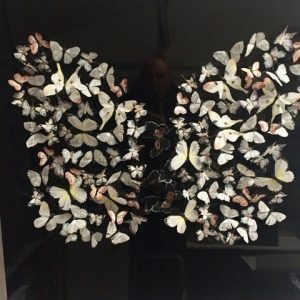 Without even looking at the available data, It seems clear to me that the lack of visible Butterfly sightings during the summer months that numbers and species are either in decline or have disappeared altogether. Memories of ones youth can be clouded by nostalgia or recollection inaccuracies but I’m sure that I do remember seeing these beauties frequently and in many rural areas visited. How sad is it that 26 species of the British Butterfly are on a red list. The list has 5 severity headings running from regionally extinct through to near threatened. 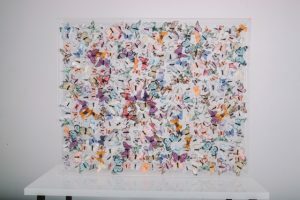 It’s my intention to create a work that includes replicas of some of these Butterflies, more of which in the weeks to come. Here are a few images of them. Obviously it’s not definitive but how can the shenanigans over leaving the EU be doing business in the UK any good? Of course it can’t, despite the fact that unemployment is down and the inference is that business is fine, it isn’t at least from my perspective. We will I’m sure, all be happy when it’s over. Thats my motto for March as I’m investing my time and hard earned income for a time when sales take off. 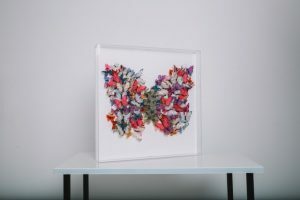 At the moment however the mention of sales seems as likely as one of my feather butterflies taking wing! No no no, in reality I’m positive and pushing forward on all fronts as follows. This week my work is for sale at The Affordable Art Fair in Battersea Park courtesy of Lilford Gallery. He has 5 pieces for sale. The following weekend sees The Wey Gallery offer my 4 of my works at The Contemporary Art Fair, Sandown Park Racecourse Esher. My PR campaign has attracted another luxury lifestyle periodical called Durrah Luxury Magazine http://www.durrah.bh/ . The article is due to be published next week and will again feature my recent work. Who knows, if the article reaches the right buyers I could be off to Bahrain for a sunny business trip. Pass the SPF 50.
will be focusing his creative lenses on 10 of my works next week. I’m upgrading my website images as it’s been 3 years since the early images were published. My designs have changed quite a bit since the early days and I want my website to reflect the current feel of my latest collection. Adieu till the next time. Even at my tender age, I possess a strong desire to learn. Last week I attended a course in order to understand more about digital marketing and my mind is still reeling. Whilst I ‘get’ the principals, the tips and tricks I need to understand and implement mean quite a change in the way I organise my day to day activities. Old dog and new tricks come to mind and I accept that if I want my little venture called Papilio to succeed in the digital world, I have to learn its ways. This I will do in the coming weeks and trust that it will have some effect upon my likes, my number of followers and increased traffic to my website. I have spent some of the past week planning production for the coming month. 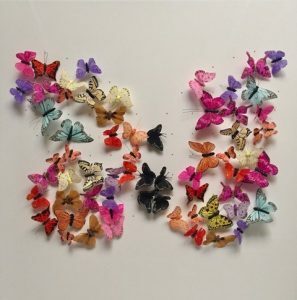 With 2 exhibitions requiring a number of works to show in March, a new gallery partner in Padstow at the same time as a photo shoot, I have 13 butterfly installations to make and deliver in fairly short order. I’m experimenting with a new idea the image of which follows. 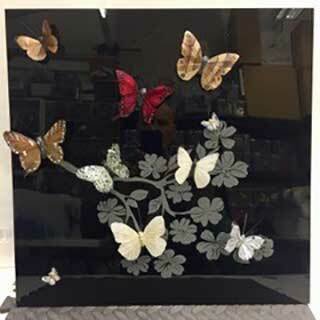 I’m creating an etched acrylic panel on to which I will replace the butterflies illustrated with some of my feather varieties to complete the creation. This is in distinct contrast to my heavy filled butterfly installations which currently form the mainstay of my work. I hope you like the idea, either way I’d love to hear from you at michael.olsen@butterflyart.co.uk. Watch out for the two, soon to be published articles about my work in the Jewish Chronicle on line magazine and Homes & Interiors Scotland. In case you missed this from an earlier blog here’s link to a very upmarket online newsletter/magazine featuring my work. Enquiries are on the increase this week which is encouraging. One is from Turkey and the other from Bahrain and 4 from UK galleries. I’ve now completed the two “Papillon de Papillon” and the completed images will be on display next week. These installations will be included in my new website tab “For sale”. I’ve started planning production for the new season of exhibitions mentioned previously. 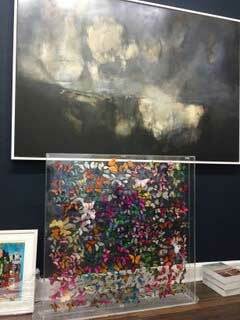 These shows are The Affordable Art fair Battersea and Esher contemporary Art fair both being held in March. With 11 pieces scheduled for delivery in mid march, I now have to get up a head of steam hence this short blog. Finally I’m very happy that the mornings and evenings are getting lighter. This light imbues me with such a feeling of freedom as I’m sure it does for most of us. I’ve referred to this topic for some time and finally the “butterfly of butterflies” has become a reality. I love it and I hope that you do to. I will be putting this item up for sale on my website as well as a multi-coloured variant when both are completed. Images of both “Papillon de Papillon” are below. Somehow its sounds and looks better in French. The aquatic installation that has been swimming around without any home, i.e. UNSOLD for some while has now been framed. Sometimes things just don’t work and whilst I’ve always loved the clean lines and modernity of the piece it hasn’t sold. I’m hoping that this change will make its future in a clients home more assured. The concept of framing my works is also something I’m considering for the future of all of my work. Apologies for image quality, acrylic is such a difficult medium to photograph. Last week was busy for me. Less about sales and more about laying building blocks for the next few months. I visited the lovely Denise Donelly and Deirdre at the Doorway Gallery in Dublin to upgrade 3 of my works recently sold. https://www.thedoorwaygallery.com Sadly there was not enough time to shop or see the sights. According to Denise, Dublin is very busy at present unlike the UK. A couple of images for you. 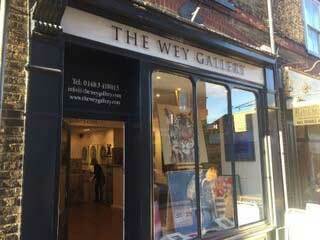 I’m happy to announce that The Wey Gallery located in Godalming have agreed to become a stockist for my works. 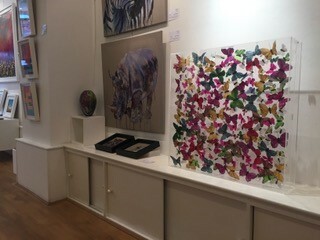 https://www.theweygallery.com This gallery occupies a lovely space in the town centre and its location close to the likes of Charterhouse School, Watts public Gallery and Loseley Park, bodes well for sales of my work. 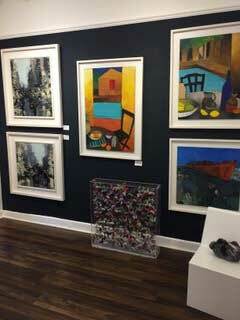 As well as on the gallery walls they will also be taking my work to 2 prestige art fairs. The first at Esher Contemporary Art, held at Sandown Racecourse March 15-17th and the other at Fresh Art at Ascot Racecourse in September. Hoping for good things here too. 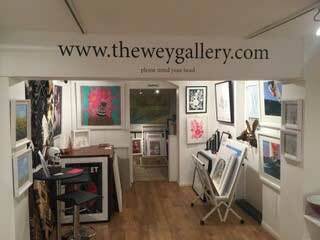 Here are some images of Wey Gallery. Not surprisingly things in the world of art are a little quiet at present. I think it’s obvious why this is so, the Brexit shenanigans and post Christmas blues.